I’ve seen the crescent moon dancing with one of the bright planets more times than I can count, but I don’t remember ever seeing a show like this. And I’ll never see its like again, unless I live to be a hundred. I tried to induce some enthusiasm in my daughter by telling her, “You won’t see this again until you’re almost 70.” She’s 15, she said something equivalent to, “Meh” and returned to her text messaging. But maybe when she is 70 and sees this conjunction again, she’ll tell my great grandchildren how she and her mom watched the last one together. What does this have to do with worldbuilding? I’m getting there. And what’s the point of having a blog if I can’t digress a little? Astronomy is important in Khasran because the Khasrani are an outdoor people. They track the seasons by the changing sky and even navigate by it if they’re traveling at night. Their culture began out on the wide grasslands under that endless sky, where the night sky is one of the best visual feasts. That’s why kargat patterns start with the main constellations, and every child learns them at an early age. If this were science fiction, I’d have to invent some different lunar and planetary configurations and research how they’d look in the sky, just to have a believable alien world. Since this is fantasy, I don’t have to be so scientifically correct. I decided to leave the earth’s rotation and its relationship to its moon, pretty much like ours, so that I don’t have to worry about different lengths of days and years and different moon phases. The moon might be a bit bigger and brighter than ours, and it’s definitely got a different pattern of craters than our moon’s “man in the moon” face. Presumably the solar system must have other planets, but I don’t know if they’re visible, as they’ve never appeared in the process of developing kargat or in any other story. I do know one distinctive thing about Khasran’s astronomy. They have an annual meteor storm during the Northern Hemisphere summer. Not a little meteor shower like we’re used to here, with tiny, blink-and-you’ll-miss-’em shooting stars for a night or two. This is a meteor STORM–look it up, they’re real enough, but rare here on Earth. Dozens, even hundreds of meteors cross the sky by the minute, with hot blue heads and bright flashing tails that light up the night sometimes as bright as day. It goes on for several days, and the Khasrani believe this annual “rain of fire” helps to rebalance the sun/fire energy with the water/rain energy after the wet season. They make it one of their biggest annual festivals, when everyone stays up all night to watch the sky and party. It will come into a story one of these days, then we’ll all see what its like. PS, this post is the first image in the blog, too, fist bumps to me! I had to download this one from AP; I’ll give myself high fives when I figure out how to link directly to an image on another site. Wow I’ve never heard of the Khasran people and what a story ! Fascinating to read and I enjoyed it and learning about them. 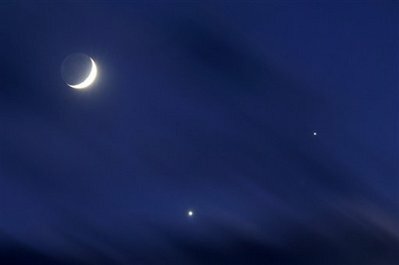 I wrote about the alignment with Venus , Jupiter and Moon on my site and this story is so interesting! Thanks, I’m glad you enjoyed the story; I’m working on more as fast as I can! Your blog is a lot of fun, too; I love your enthusiasm! I’ve got it bookmarked as a source of skywatching news.